Google has again updated their Search Results page to give more information about Authors and closer integration with Google Plus. If you have implemented Rel = Author for your website or blog then this information very much relates to you. 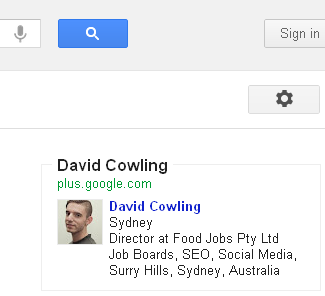 Rel Author allows your picture and a link to your Google+ profile to show on the search results page. If you would like to implement Rel Author on your site we have an article that explains the steps you need to take. These new changes have been rolled out on Google.com as I found last night. So the by David Cowling has been showing for sometime. But the new change is More by David Cowling. You can press this link to read more articles about the specific author. 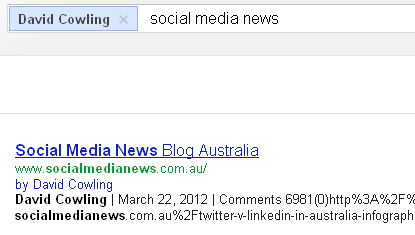 Google is focusing significant efforts on Authorship and getting quality content more visible. Depending on how many articles that author has posted, there may be a large amount of results. As I said above this update so far only applies to Google.com – when this change is rolling out to Australia on Google.com.au I will let you know. I’ve previously said that having your Author information in search results highlights you as a quality and authority figure, higher CTR to your website and also encourages more activity on G+. I recommend if appropriate you add this feature to your code.